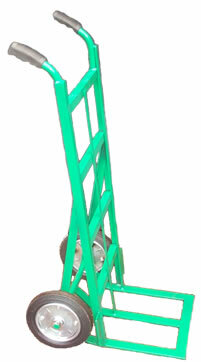 This Alan Stuart Engineering Ltd, heavy-duty hand truck was originally designed for Tuffnells Carriers. The carrying capacity of this heavy-duty Hand trolley is up to 400Kgs and it is made of a very robust construction ensuring longer life within its handling environment. For more information on Alan Stuart products including Heavy-Duty Hand Trucks, Sack Trucks, Handling Equipment, Hand Trolleys and Piano Trolleys then please contact us.